Trump’s trade policy is stuck in the ’80s — the 1680s. Trump’s tariffs are already backfiring. 6 questions about Trump’s economy you were too afraid to ask. We know who really rules the Gunshine State. How an Ivy League economist got ethnically profiled & interrogated for doing math on an American Airlines flight. What happens when gray mixes with brown in America. A tribute to Debbie Reynolds, happiness, and hard work. Meet the homeless man who works in the U.S. Senate. The B.S.-ing arms race happening in your office. Scott Walker’s yellow politics (and why we should start drug-testing grandma). Voter suppression laws may already be affecting election outcomes. Millennials want to ‘grow up,’ but many life milestones remain out of their reach. What Rudy Giuliani could learn from King Lear. A complete archive of my writings for The Washington Post (including my twice-weekly columns and Rampage blog posts) is here. You can find my writings for The New York Times here. Some Marketplace appearances are archived here. Here’s a Making Sen$e segment I did with PBS Newshour, on the fallout of Trump’s washing machine tariffs — for American consumers, companies, and workers. A random sampling of other TV appearances is here, here, here, here, here, here, here, here, here, here, here, here, here, here, here, here, and here. 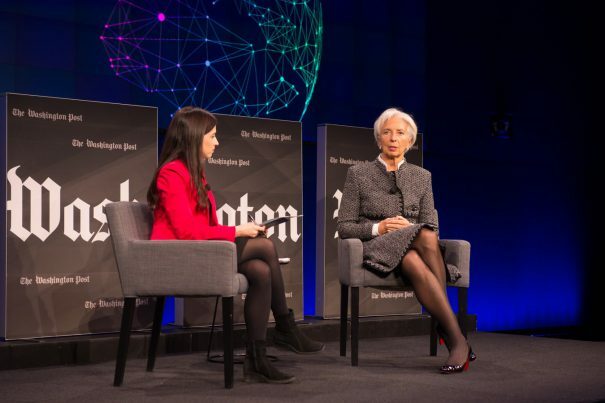 At a Washington Post Live event with IMF Managing Director Christine Lagarde.